The revolutionary RE/MAX Concept of enabling real estate professionals to maximize their business potential has evolved into an organization of more than 100,492 Associates in more than 5,401 offices worldwide. RE/MAX has grown every single month for more than 30 years-a claim very few global companies can make. 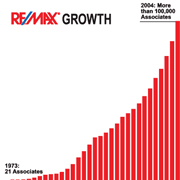 In 2004, 13,167 new associates joined the RE/MAX network. Adding nearly 15,000 agents per year, total passed 100,000 in 2004. Open offices surpass 5,400 in more than 50 countries. North American TV advertising: 5.3 billion impressions.